They called me Angel of Death, but I am something else. Someone else. That is if you believe the Egyptian desert god, Seth, who haunted my dreams since I can think. Sounds crazy, huh?I, too, thought I was insane. DO NOT read this review unless you read Book of Souls. 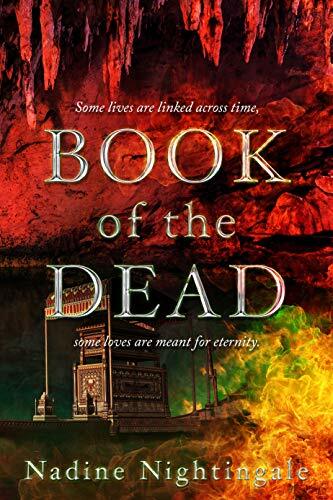 Can I tell you how relieved I was when Nadine Nightingale finished writing Book of the Dead?! Book #1, Book of Souls, ended on a “hell” of a cliffhanger! Nisha Blake has had to accept that she is Egyptian Princess Nebt-Het reincarnated. Her beloved cousin Izzy has been kidnapped through a portal into the Underworld. Only Nisha can save her though she might lose her life in the attempt. Parallel back to Shaggy, Scooby, Blaze, and Oz who are trying to find the original Book of the Dead. Blaze being the reincarnated Medjay (as in the Phoenix) is the only one that can help Nisha and Izzy. Easy right? Not so much! Then there is the villain of the story – Seth. Is he really a villain or more of an anti-hero? I mean he was betrayed by his wife and best friend. You can’t blame the guy for being pissed off. It’s obvious that Nadine is deep into Egyptian mythology or really did her research because it had me hooked! Add running two simultaneous story timelines and it could get muddy. No, it actually does not. She wove mystery, love, angst, betrayal and paranormal elements seamlessly. I thought I was ready for this ride to end but it turns out I’m not. I could tell you more. Like the very interesting nuggets, we learn about Nisha. And Blaze. Or does Nisha really hate Seth? No way! I’m not saying anything else. Read it for yourself. We now move into Book 3. Let me tell you, I’m here for it. Nadine get to writing!